A couple days ago we reported La La Land was going to premiere a new 3-CD set of music from Star Trek: The Next Generation at San Diego Comic Con (next week). La La Land have now provided TrekMovie with a full detailed track listing along with cover artwork from this exciting collection. Find out what is in the set below. Recorded September 18, 1989, at 20th Century Fox Scoring Stage, Los Angeles, California. • Debuted September 25, 1989. Airdates varied in local markets, due to syndication. Published by Sony/ATV Harmony (ASCAP). Additional Orchestrations by James Hill. Recorded September 18, 1989, at 20th Century Fox Scoring Stage, Los Angeles, California. Recorded May 21, 1992, at 20th Century Fox Scoring Stage, Los Angeles, California. Recorded September 1, 1987, at Paramount Pictures Scoring Stage M, Hollywood, California. • Debuted September 28, 1987. Recorded June 9, 1989, at Paramount Pictures Scoring Stage M, Hollywood, California. The limited edition 3-CD set will debut at the San Diego Comic-Con, July 20-24, (housed in the Toy Hungry booth #429), and will later be made available on the La-La Land website – www.lalalandrecords.com, as well as other soundtrack online outlets, beginning August 2, 2011 (suggested retail price $34.98). Although I don`t have the Ron Jones-Project, which I really regret, since I do own almost all CDs except the ones from original TREK – Hey, I grew up watching nextGen! But Lalala Land Records has released some amazing Music over the years,most notably the BSG Soundtracks, the 3-Disk “Human Taget” Collection and of course the brilliant 2-Disk Extended Version of Goldsmith`s “Star Trek: V – The Final Frontier”. I do own all extended an “complete” Soundtracks of TREK – so I have most of the CDs in “normal” versions and “longer” versions, like ST 2, 3, 5, 6, 8, 9, 10 and STXI. I did not know at all, that Debney had composed music for TNG! ha,ha,ha!!! A CG generated Enterprise-D on the front, I notice. Maybe how it’ll look someday in CBS’ mooted TNG-R project? Well that is what La La Land sent us. Why the question? CG? Are you sure that’s not the opening shot from Farpoint? My brain doesn’t have a 1701-D encyclopedia like it does for the TOS ship. Damn. I take THAT statement back. We need complete recordings from The Original Series. The are only a few episodes represented in commercial release. TOS music is the soul of original Trek. Tobias, that sure does look like your rendering… pixel for pixel. it’s a pretty difficult thing doing renditions of copyrighted stuff and putting it out on the net… I’ve had some of my stuff “pilfered” too… and it isn’t pleasant. Tobias: That does look identical to yours. I love the work on your site (used them as many a desktop background). Hope you’re able to get to the bottom of this mystery!! There is a lot of that going on, though… just because CG artists put stuff up on their sites for the enjoyment of people doesn’t mean it is fair game to be put onto packaging for paid products. Damn, you wake up one morning and possibly find your work stolen and put up for sale on the Internet. …the best part of waking up…..
Has there been a change in things with GNP since the Ron Jones box? I notice this has music that has previously appeared on GNP discs (The cues from ‘All Good Things..’ which were on one of GNP’s Best of Star Trek CDs) whereas I remember hearing that Lukas couldn’t licence the Best of Both Worlds material that had appeared on GNP’s ST: TNG Vol.2 for the Ron Jones Project. It’d be great if this has been resolved, as not only could it mean some TOS sets (which need to be out there), but potentially an expanded/complete release of GENERATIONS. Yes, why can’t we get TOS soundtracks released like this?? Nicely done release by the look of things, and agree with Charlie and Jeffrey that it would be great to get the TOS soundtracks released like this sometime! However, one of my own biggest disappointments with the NEXT GEN series (and other subsequent ‘Trek’ series too), was it’s mainly unmemorable, bland music overall. Personally, I sure would have preferred the various atmospheric TOS cues to have been re-used throughout the OTHER ‘Trek’ series that came afterwards too. By the way Charlie, I also agree that an expanded/complete release of Dennis McCarthy’s GENERATIONS score would be neat, as it was the best thing to come out of the movie! Some terrific music in that, I reckon. 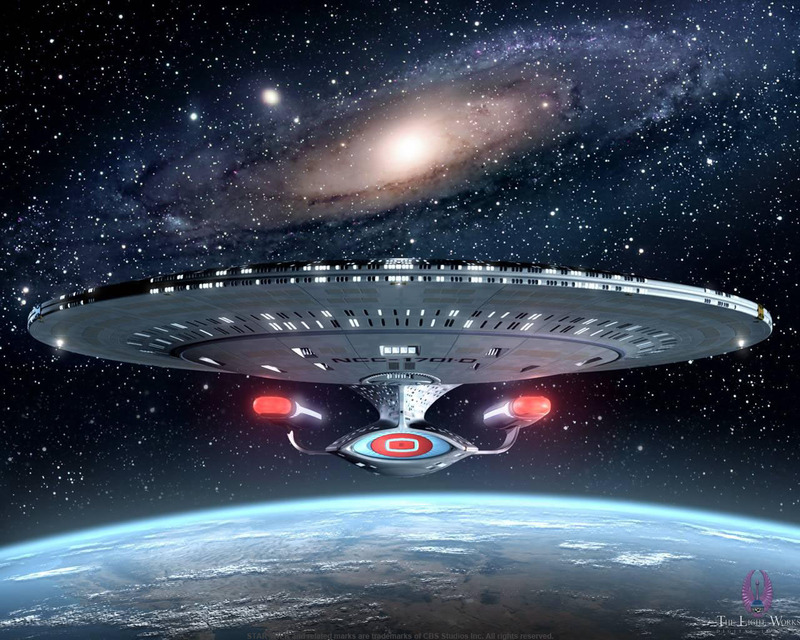 By the way, very nice rendering of the NEXT GEN ‘Enterprise’ there Tobias. Anthony, will there be an update on Trekmovie when the set becomes available on the Lalalands website or other CD retailers? Get In….now, when do we get the full score for Generations??? Come on, its lurking around somewhere!!! Glad this got a review- why No mention of the new Star Trek Comics Omnibus- “Movie Classics” ? “Star Trek (TOS) Polka Version”? I’m no expert but for those asking about TOS boxsets, Trek music guru Jeff Bond chimed in around this time last year and mentioned that there were “issues” to be worked out. The guys who run these labels know there’s a demand but there are probably a thousand and one things that have to happen first. I went a bit crossed trying to read the whole tracklisting, is the iconic Best of Both Worlds cliffhanger music not there? I mean, come on! I believe that track is already available on GNP Crescendo’s “Best of Both Worlds” disc. A lot of Season 1 and 2 music, I notice. That’s a good sign — TNG music was allowed to be surprisingly rousing early on. I’ll take Ron Jones over the rest of the “wallpaper” scores any day. Cool that it’s available though. $34.98? I’d feel like a *thief* buying a gem like this at $34.98! Well let me chime in, too, about wanting a TOS boxed set of soundtracks. Most of TNG music is boring and bland, but there are exceptions. So come on LaLaLand, how about some TOS music?!? darendoc, too bad about Creation “borrowing” your work. I’d rather the followup be DS9, which had some excellent music in its later series. Hmm… I dunno… too bad cause and effect is not on here. Are there any tracks from Paul Baillargeon who composed also for DS9, Voy and Ent? I agree with Cervantes. While the music on all the NG series was serviceable, only the themes are distinctive, with the Goldsmith’s ranking (TNG, VOY) at the top. it’s too bad the mandate from the top was to not develop themes for the characters, because that would have made all these series more interesting to me and way better than they are.